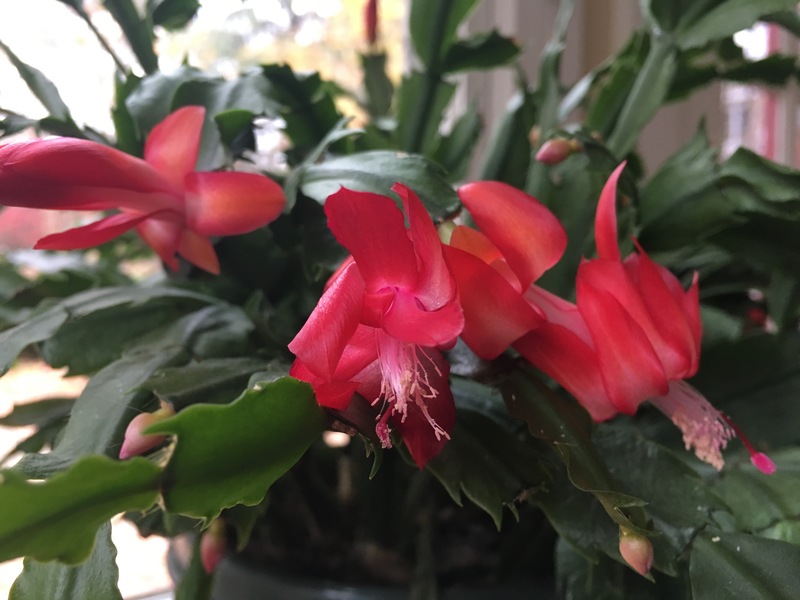 My Christmas cactus always blooms at Thanksgiving! I love to prepare meals and nourish my loved-ones with simple, delicious, healthy food. And I’m always happiest when the ingredients are local and organic. I especially enjoyed putting together our Thanksgiving meal last week. With my daughter, her partner, and the grandkids here, I found it especially rewarding to share the bounty of our local and organic gardens and farms. I was first introduced to good food, when I was just a little kid. At the time I didn’t really appreciate the then yucky flavors that would one day become the those that are are my favorites. Take spinach for example. Once when I was about four years old, my mother warned me that there would be no dessert unless the spinach was gone from my plate. I hated spinach. When she wasn’t looking, I squirreled away of the dreaded green stuff by the forkful under the cushion I was seated on. I got my dessert that night, but she discovered the sticky mess the next day. I got into a bit of trouble. I haven’t cooked a huge holiday meal in many years. When it’s just Bill and me, I prepare a lovely meal, but usually without the dessert and the multiple side dishes I like to prepare. Since we both have some weight issues, one of the house rules is that if you want a something sweet after a meal, you have to go out and enjoy it at the ice cream shop, or one of the fine bakeries nearby. And only one serving, please. If we brought home whole cakes, a dozen cookies, ice-cream by the pint, or any other tempting sweet, they’d be polished off within a few eye blinks. This year I prepared my famous pumpkin pie which includes a few secret ingredients and is loved by all who take a bite. Being gluten free, I tried a piecrust made with coconut flour this year. Though everyone else liked it, I prefer the delicious nut crust I usually make. The secret ingredients include a layer of tart orange marmalade spread onto the crust before adding the pumpkin filling, to which I have added several tablespoons of brandy. Oh my, what a treat. I think I’m going to make it for Christmas dinner as well, just because we love it so much. Then back to no dessert in the New Year. I also managed to prepare a knock-off of our favorite stuffing with dried Gluten free bread cubes I picked up the grocery store. The great taste comes from adding butter sautéed turkey giblets, onions, and again garlic. I also add diced apples, pecans, dried cranberries, homemade bone broth, an egg or two, and fresh cut sage, thyme, and parsley from my garden. We just finished off the leftover stuffing on turkey sandwiches that we also smother with homemade cranberry sauce. Oh, my gosh, YUM! We’ve been eating high off the hog and we’re just finishing up the leftovers. I think I’m going to make the remaining sweet potato puree into muffins or a creamy soup to which I’ll add whatever grabs my fancy at the time. To the muffins I might add some walnuts and dried cranberries, or a dollop of cream cheese. To the soup, I’ll dilute the puree a bit with bone broth or coconut milk ing add some curry powder. Chick peas would give it bit of crunch, and a handful of greens of some kind, would add more color. Ready to make turkey bone broth! 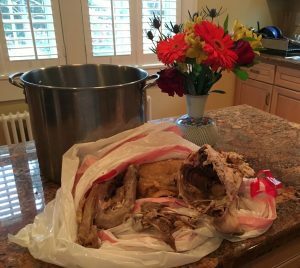 Yesterday I made bone broth from all the turkey bones, leftover skin, and whatever else remained. There is enough sliced turkey left to make a warming soup, a few more sandwiches, and we’ll finish off the bits and pieces with turkey fried rice. For me preparing food is much like making art. You take your givens and make something beautiful by adding whatever else you find in the pantry or fridge. It’s a creative act and loads of fun. Along with writing, painting, and working in the garden, I do love cooking. Do you like to cook and experiment with different ingredients in your kitchen? What kinds of things do you enjoy preparing most? I hope your Thanksgiving was as wonderful as mine. Guess what? There are more holidays just around the corner! 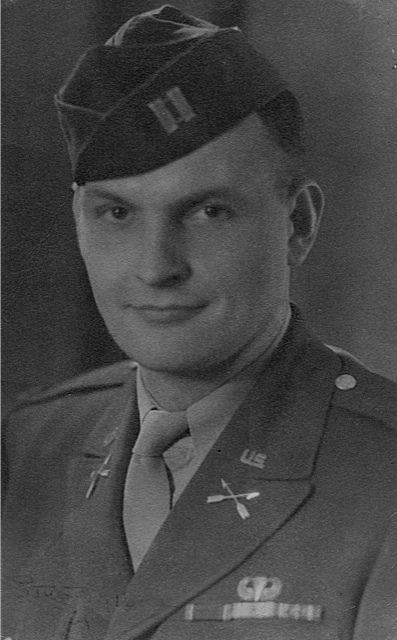 I considered saving this post for Father’s Day next month, but after much thought decided this post was most apt for Memorial Day, because it was my dad’s participation in the First Special Service Force, during WWII that shaped his life more than anything else. Called the Devil’s Brigade, by the Nazi’s because of their dare-devil bravery and skills, this American-Canadian commando unit was organized in 1942. You can learn more about them here. 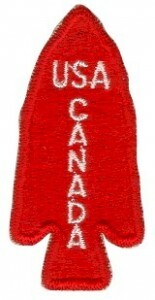 1st Special Service Force Patch. The day after marrying my mother on February 14, 1942, Dad enlisted and was sent to Helena, Montana, where he trained as a paratrooper, learned to ski, and fight in winter conditions. On completing training in 1943, his unit was sent to Kiska, in the Aleutian Islands, where he and his comrades were to take down the Japanese forces gathering there. 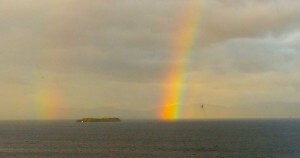 But finding that the Japanese had evacuated the island in anticipation of their arrival, the force was sent to Italy. Dad was dropped over Anzio, and worked his way up the boot of Italy into Southern France and eventually to Germany, where he and his men opened up the gates of German concentration camps, to set those who had survived the Holocaust free. He remained in Germany after the war, working in intelligence for the army. Mom and I joined him there in 1946 and my brother, Zed, was born in Munich, Germany, in November of 1947. As Dad worked his way up to the rank of Major, he was part of numerous catastrophic battles and traumatic events. After his drop over Italy, he became aware that the plane scheduled to drop troops in the same spot after his, tragically dropped them into the Mediterranean, due to the same bad weather conditions my father’s plane had encountered. The entire load of soldiers drowned. Never physically wounded himself, Dad found himself to be the last man standing, as his unit worked at taking out a nest of Nazi’s. After another battle, he saw his best buddy’s head blown off as they stood together overlooking an area they believed they’d cleared of German troops. Dad rarely talked about his experiences or his medals for bravery, but it was evident that the war had brought about huge changes in him. Mom always said he wasn’t the man she had married when he returned home after the war. At the time, a returning soldier’s constant mood swings and violent behaviors were blown off as Shell Shock, something he and others in his position would grow out of. If they didn’t, they were thought to be lacking resilience and were poor soldier material, despite their heroic acts during the war. Post Traumatic Stress Disorder, is the result of participating in war, being a victim of abuse, or being witness to, or affected by a traumatic event. It came to everyone’s attention during the war in Viet Nam, and as our knowledge in the field of psychiatry has expanded, troops returning from the Middle-East are checked for this debilitating syndrome that can take down families if left untreated. Throughout his life, Dad fought a war within himself. He ran our family as a military unit, inspecting the way we polished our shoes, made our beds, and kept ourselves. Finger nails had to be clean and trimmed, and our ears were to be without wax or dirt. Our rooms had to be organized and spotless. If he observed a book out of place on a bureau he would sweep the book and everything else onto the floor, demanding that we clean up the mess he made. He could be very silly. He was big on punishment and beat my brothers and me with a horse crop. 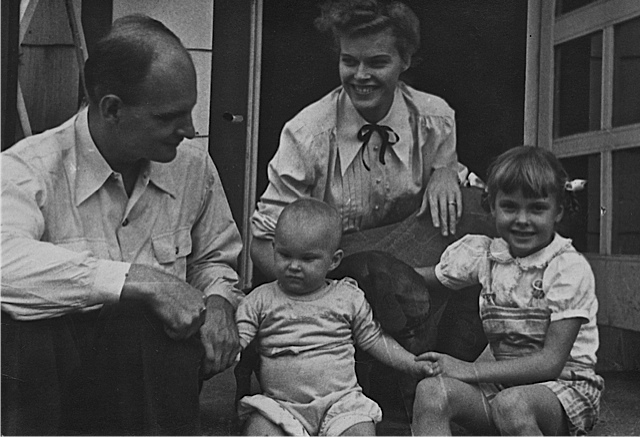 We never knew what to expect from him and rarely felt completely safe when he was at home.When my parents fought, which they did frequently, I feared Mom would leave and I’d spend the rest of life living alone with Dad. When he died in 1982, I began working through my inner turmoil and recovery from my own PTSD. Yes, the children and spouses of those with that disorder often have it, too. Writing a memoir and keeping a journal have helped me to recall even the special moments I spent with with my father. That when I was small he’d collect a big bowl of snow after a storm, drizzling it with maple syrup and orange rind as a special treat to celebrate a day when we could all stay at home. Without yelling at me, he taught me how to ride a bike, water ski, and drive a car. He sadly gave me away to my husband, Bill, at our wedding, and when my own kids arrived, he became my friend, as I watched him soften and play with his grandchildren. I remember the last time I saw him alive in the final stages of bladder cancer. He told me he didn’t want to live any longer. Upon advice from his doctor, I told him that he could make his exit by simply pulling out the IVs and lines keeping him alive. Several nights later he died, having pulled his own plug. Dad and Mom with Zed and me. Though I’ll never forget how he abused me, forgiveness and love have taken the place of hatred and fear. He did the best that he could with what was available to him at the time. For that alone I see him as a hero. Unless you’ve been in the shoes of someone who suffers from flashbacks, panic attacks, and all the rest that goes along with PTSD, it is impossible to understand the pain and fear of living in world where trauma and stress seem to be around every corner. Recovery and forgiveness are possible. The Body Keeps The Score, by Bessel A.Van der Kolk, MD, and Michele Rosenthal’s, Your Life After Trauma: Powerful Practices to Reclaim Your Identity, are two books that have helped me gain an understanding of how trauma changes the way our brains operate and how to begin the road to recovery. If you or a loved one suffers post-trauma, give them a read. Has trauma shaped your life? You’ll find out more about my own journey through trauma and PTSD in my upcoming memoir, ME, MYSELF AND MOM, My Journey Through Love, Hate, and Healing. I’ve been off traveling in Vermont for the past six days. I visited with my brother, my nephew and neices, friends, old and new, and soaked in the essence that only Vermont offers at this time of year. I tried and tried again to capture the colors of the leaves with my camera, but finally gave up. Like the Grand Canyon that I gave up photographing years ago, there are some things it is best to experience rather than capture. We may think we can capture it all on film, but we can only really capture it in our hearts through the thrill of being there. Right now I need to catch up on bill paying, the laundry, and the everyday details of survival in the twenty-first century. Next week I ‘ll be back with a story about seeing my college room mate after some twenty-five years and how we became known as the “Ski Twins,” in the old days. 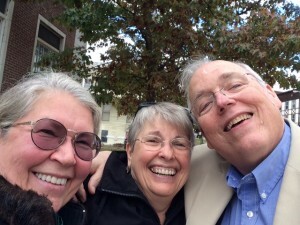 Facebook friend, Janet Givens on the left and the love of my life, Bill, on the right. I forget which one of us took it! Word has it that I’m a little crazy. Admittedly, I’m different from a lot of other people, but you’re different from everybody else, too. We can all come up with some crazy ideas. They may be foolish, idiotic, silly, farcical, laughable, nonsensical, or half-baked, but everyone gives birth to them and it doesn’t mean that we’re all mentally deranged. I do go by the name Batty, sometimes. That’s what my grandchildren call me. My nieces call me Aunt Batty. It started when my granddaughter Zoe, now fourteen, started to talk. I don’t know why she started calling me Batty, but it stuck and is quite an apt name. I much prefer it to Granny, Grammy, or Nana. To me, Batty simply means different. I may be what others call ditzy or eccentric, but I’m not unhinged. I’m dissimilar to many, but we are all different from one another. Janet, down the street, has red hair and thinks vanilla ice-cream is to die for. John, over on Main, has black hair and loves to skydive. They may be poles apart when it comes to religion and politics. They are both individuals. Some of us are more open than others and some of us are happier than others. Some people suffer from depression. Others might be bipolar, or possibly, schizophrenic. They are not crazy. They have a mental illness that in most cases is treatable, just like TB, cancer, or the common cold. When I was small, the talk amongst family members was that my grandmother on my mother’s side was “crazy.” She apparently did some horrible things that no one ever talked about and was eventually found to be an unfit mother. She became the big, dark family secret. Everyone whispered about her and some wouldn’t talk about her at all. They seemed to think that if anyone mentioned her in public, the neighbors would find out that she was insane and shun the whole family. It was all about how they looked in other peoples eyes. I was never told what her mental health issues were or if she was ever treated. But as a kid, I adored her. I didn’t get to see her very often, but when I did, I thought she was funny, loving, and an original. Her hair was short, frizzy and dyed a strawberry blond color. She laughed a lot in a loud kind of way and had canaries in cages all over her house. I didn’t believe what everyone said about her. But as I got older and my mother told me a few stories about her, I knew she was mentally ill.
As someone who has often struggled with depression and anxiety disorder, I sometimes thought I might have inherited my grandmother’s problems. 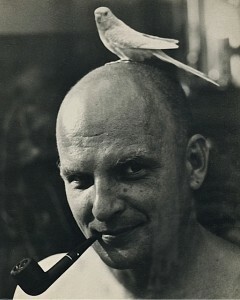 I was ashamed and feared that someone might discover I was crazy, mad, cuckoo, loony, or wacko. For me that translated into being, “ A bad and worthless person.” My father’s parents knew about Grandma, and delighted in telling my mother that, “The apple never falls far from the tree.” Because of their cruelty, I’m sure my mother felt great shame and worthlessness. I’ve been diagnosed with PTSD because of childhood abuse. My father had it as a result of his experiences fighting in World War II. My mother came from an abusive home and she most likely had it, too. They were not crazy, nor am I. In seeking treatment I’ve worked long and hard to minimize my symptoms by understanding how the brain changes when a person is abused. I know that recovery is possible and can provide us with happy and peace filled lives. Sure, I can still get depressed or have a panic attack, but I know what to do to make myself feel better. Hiding mental illness by sweeping it under the carpet or making cruel judgments about it, only makes the stigma worse. In todays world, many with mental illness are beginning to speak out about their problems, their need for support, and proper care. Let’s stand tall to end the stigma of “crazy” together. Speak out. If you struggle with mental illness seek treatment. You have nothing to be ashamed of. 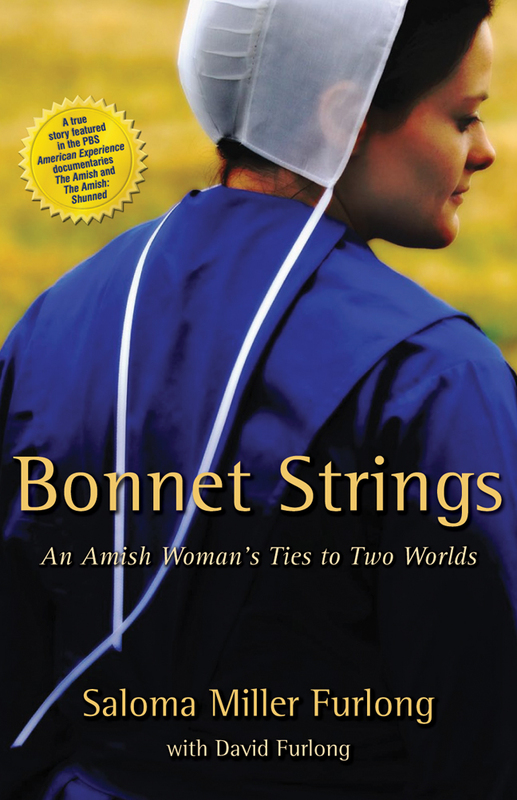 Always interested in reading about other writers’s spiritual journeys, I recently picked up a copy of Saloma Miller Furlong’s second memoir, Bonnet Strings: An Amish Woman’s Ties to Two Worlds. I just finished reading it and highly recommend you take a look at it. Next week, one of my readers who leaves a comment on this page, will have a chance to receive a free copy of that book. Just leave a comment. I’ll pick a name at random and perhaps you will be notified that Saloma’s book is on it’s way to you. Currently, Saloma is at work on a letter to her mother in book form, in which she tries to reconcile with her mother, who is now dead. Both Saloma and I have had difficult mothers to deal with during our lives. It is through this new writing, that Saloma is working her way to understanding and forgiving a mother, who like mine, used her children as scapegoats. Without further ado, I welcome and thank Saloma for being my guest today and sharing her story. I have seen Joan around the online world several times. I decided it was time we “meet,” after reading about her incredible journey. Though I have not cared for an aging parent, I can relate to Joan’s story in many ways. I eagerly await the publication of her book. I am honored to be here today. Thank you, Joan, for hosting me. We’ve all heard the bittersweet stories of people reckoning with their mortality when they are about to leave this world. They took stock of their lives and asked to speak with someone with whom they’ve not spoken to for years. In their waning days or hours, reconciliation and forgiveness happen. The bitter of the story is all those wasted years when reconciliation could have happened. The sweet of the story is that reconciliation did happen. When my mother was dying, I kept hoping she would come to the place of needing reconciliation, when she would gather her sons and daughters around her and deal with any unfinished business with each of us, alone. I was hoping there would be a time when she would let her guard down, so that I could tell her how I’ve had a hard time reconciling my memories of her when I was small and innocent from those when I was in my teens. I know Mem loved me when I was little. I remember her bathing me in the galvanized tub in the living room in winter. After the bath, she would sit me on her big, soft lap, wrap me in a warm towel she had warmed by the woodstove, dry me off, and then dress me in the fresh-smelling clothing she had laid out for me. I remember standing on a stool, helping her knead bread. I remember being terrified of leaving her when I started Kindergarten. I could not run. I could not hide. I could not resist that voice. I had to step over to her, where she would raise my Amish dress and slam that whip or belt across the backs of my legs, until I thought I would lose my mind from the overpowering pain. But that is not what happened. Mem told us not to cling, and said it was her time to go. It seemed that she couldn’t duck out of this world fast enough. There was no chance of reconciling with her. Even before that day, she did not want to dig into the past. “For what good would it do?” she would say. When I said my last good-byes to my mother, I told her that I would think of her in her heavenly home, and love her always. I wrote her a letter the night she was dying, because I could not be by her side. When I read it now, it sounds like I had no unresolved issues with her. However nine years later, I realize I’ve never reconciled the mother who was so nurturing and caring, with the one who was so harsh and cruel. In an attempt to reconcile with Mem, I am writing a letter to her. I sift through memories and reflect on them. I do this, not knowing “what good it will do.” I don’t know if I will have a better understanding of her, but that is my hope. I like to think that there is still time to find resolution, even though she is not here in person. So far, I find the act of writing to be powerful. Instead of sitting down in the inner reaches of my unconscious, I am recalling the past, allowing it to surface, one piece at a time. I am examining my memories of Mem, my relationship with her, and ultimately, my life. As I write this, I don’t yet know who my audience is. Right now, that is not as important to me as doing the writing. Maybe I will decide to publish it. Or maybe someday one of my sons or grandchildren will find it, and at least learn something about their lineage. I cried when I read the quote, by Christina Baldwin, that Joan uses at the top of her home page. I recognized it as the compelling reason for why I feel the need to write down my memories. “Making story of our family history doesn’t mean we change the realities of our forebears’ lives … we don’t turn a thief into a pillar of virtue … but we learn to carry the story differently so the lineage can heal.” What a beautiful thing to hope for: “for the lineage to heal.” What more is there? Are there issues with your mother you wish to come to terms with? Do you think it is ever too late? Saloma Miller Furlong is the author of two books, Why I Left the Amish and Bonnet Strings: An Amish Woman’s Ties to Two Worlds. 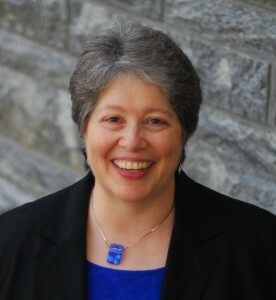 Her story is featured in the PBS documentaries “The Amish” and “The Amish: Shunned” on American Experience. 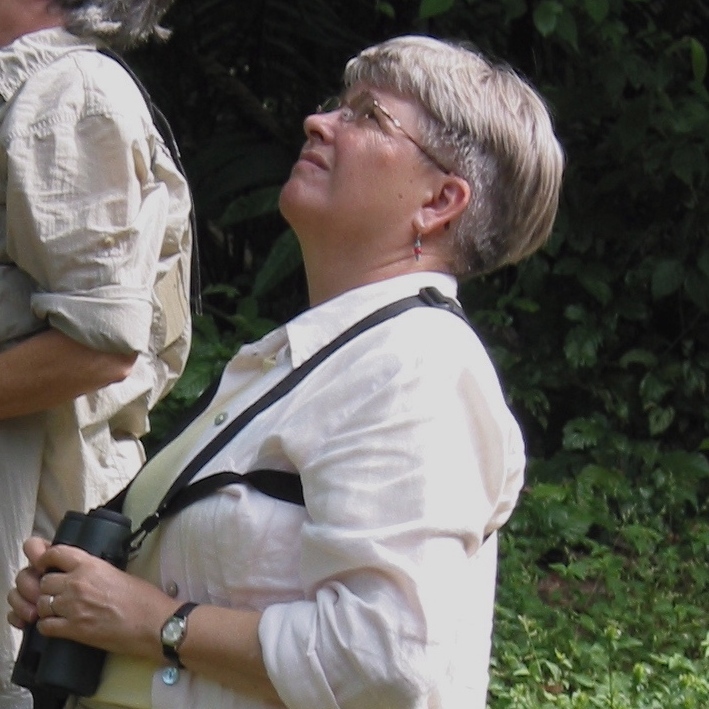 You can read more of Saloma Furlong’s biography by following the link. Have my blog posts delivered directly to your inbox. Your email is safe with me. Wife, mother, grandmother, writer, blogger, gardener, artist, healthy food nut, loves all creatures, especially dogs. Addicted to books, good movies and the grandkids. Believes in being positive, choice and taking responsibility. Easily overwhelmed by it all, but never bored. Laughing and smiling all the way.